344 pages | 12 B/W Illus. Revising and Editing for Translators provides guidance and learning materials for translation students and professional translators learning to revise the work of others or edit original writing, and those wishing to improve their self-revision ability. Revising and editing are seen as reading skills aimed at spotting problematic passages. Changes are then made to meet some standard of quality that varies with the text and to tailor the text to its readership. Mossop offers in-depth coverage of a wide range of topics, including copyediting, stylistic editing, checking for consistency, revising procedures and principles, and translation quality assessment—all related to the professional situations in which revisers and editors work. 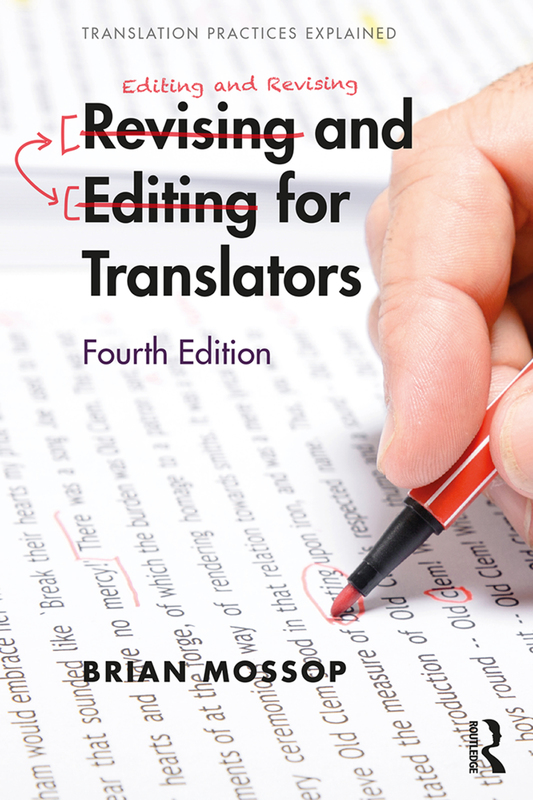 This revised fourth edition provides new chapters on revising machine outputs and news trans-editing, a new section on reviser competencies, and a completely new grading scheme for assignments. The inclusion of suggested activities and exercises, numerous real-world examples, and a reference glossary make this an indispensable coursebook for professional translation programmes. "It breaks down and explains editing and revising practices in a simple way … making the text an easy and pleasant read. Teachers, both in academic and non-academic contexts, will avail themselves of the easy-to-follow categorization of the contents of the book, in the event that they want to design a course or module on editing and revising." Michail Sachinis, The Interpreter and Translator Trainer 4:2, 2010. "An extremely worthwhile read and reference source for anyone involved in the processes of editing and/or revising"
9.1 Google to the rescue? 9.3 Work on screen or on paper? 9.5 What kind of screen environment? 12.2.1 Which parameters will be checked? 12.2.2 What level of accuracy and writing quality is required? 12.2.3 Full or partial check? Brian Mossop was a French-to-English translator, reviser and trainer at the Canadian Government’s Translation Bureau from 1974 to 2014. He continues to lead workshops and webinars on revision in Canada and abroad. Since 1980, he has also been a part-time instructor at the York University School of Translation in Toronto, teaching revision, scientific translation, translation theory and translation into the second language.